Welcome to Jurassic World. Colin Trevorrow's new entry in the Jurassic Park series has broken numerous global box office records, and is still playing strong in theaters around the world. One of the better parts of the film is the score from composer Michael Giacchino, who does his best to hold his own and deliver an exciting soundtrack for the dinosaur movie. There's no point in comparing John Williams work because he really is in a league of his own, but I'm just as impressed by the score Giacchino came up with for Jurassic World. 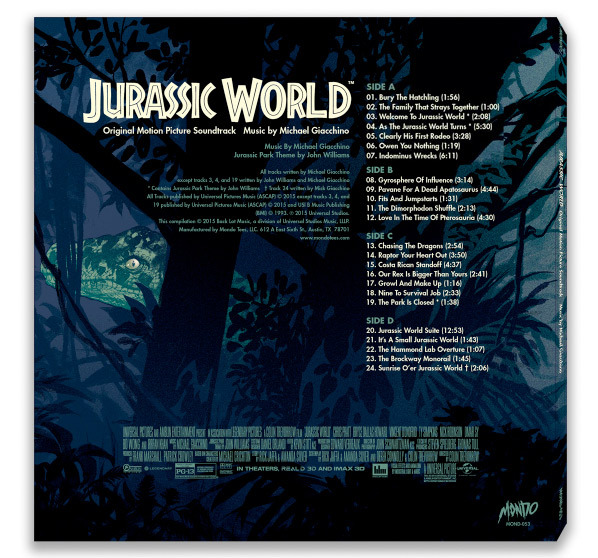 Austin based art house Mondo is releasing a special limited vinyl pressing of Giacchino's Jurassic World score with art by Stan & Vince. Even if you don't really need the vinyl, the artwork is worth viewing. 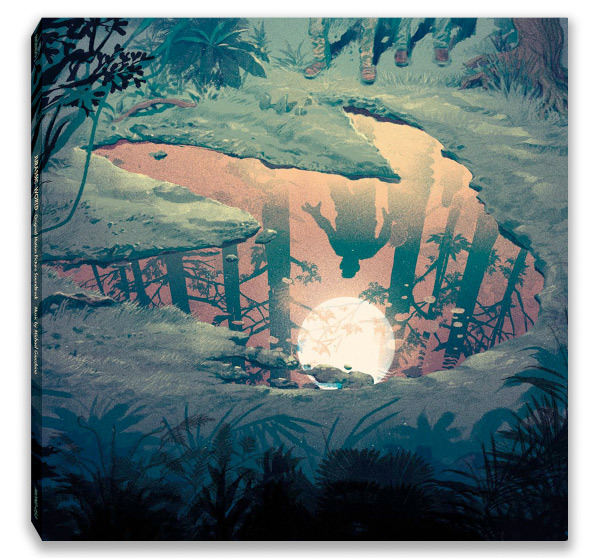 The vinyl will be available for pre-order starting Friday, June 26th on MondoTees.com. This 2XLP will be pressed on 180 Gram Translucent Green Vinyl with a Blue Stripe in honor of Blue the Raptor (or you can get order regular black vinyl). The album will ship in September, however it will be available for pre-order soon. 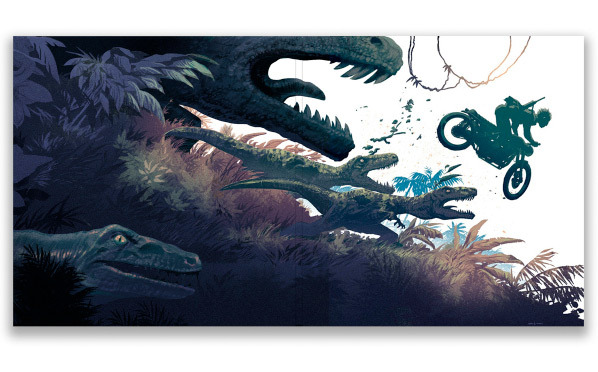 For more info on the Jurassic World vinyl and to pre-order, follow @MondoNews or visit MondoTees.com. Jurassic World is directed by Colin Trevorrow (Safety Not Guaranteed), who rewrote the script with Derek Connolly from an earlier draft by Rick Jaffa & Amanda Silver (Rise of the Planet of the Apes, Dawn of the Planet of the Apes). No plot details are available yet, but the film has been said to feature a new operational dinosaur theme park, just as John Hammond imagined over 20 years ago. The cast includes Chris Pratt, Bryce Dallas Howard, Nick Robinson, Jake Johnson, Ty Simpkins, Vincent D'Onofrio, Irrfan Khan and B.D. Wong, reprising his role from Jurassic Park. Universal opened Jurassic World on June 12th. Sound Off. Beautiful artwork, by the way. I didn't even know it was a Giacchino score. Kind of wasted his talent on this film. Oh jeez that's cool. I don't even own a record player and I want this.